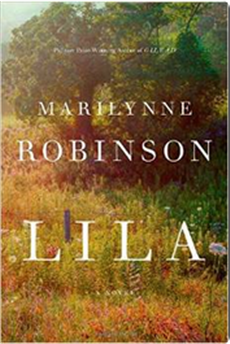 In Lila, wonderful writer Marilynne Robinson returns to the small Iowa town of Gilead, the setting of her previous novels Gilead and Home. In these novels Lila Ames is not much of a presence. She is referred to as the surprising choice of a wife for the elderly, gentle, and educated pastor John Ames—much younger, rough, and uneducated. Lila has lived almost her entire life on the tramp, ever since Doll stole her away, a neglected, starving, feverish little mite who lived mostly under the table or was locked out of the house. Doll and Lila joined up with a group of travelers lead by Doane, wandering from job to job, and life was just fine until the long, dark days of the Depression and the Dust Bowl. Years later, Lila has stopped outside Gilead and is living in a shack, walking to nearby farms and houses and asking for work. Lila knows nothing about religion, but on occasion she has been curious about it and was warned away by Doane, who claims all preachers are charlatans. So, one day she ventures into the church. There she sees and is drawn to John Ames, and he to her. Eventually, they marry. The action of this novel is mostly interior. Lila is tormented by some of the memories of her previous life and feels unworthy of Ames. She is afraid that he may ask her to leave at any minute. All the same, she occasionally wants to return to the freedom of her old life. Ames, on the other hand, is happy to have Lila’s company, for he has lived alone ever since the death of his wife in childbirth, years ago. He is afraid she will decide to leave him one day. As with Gilead and Home, this is a quiet novel, characterized by religious discussions as Lila tries to read and understand the Bible. She has no prior relationship to religion, but she has vowed that John Ames’s son will be brought up praying, as his father does. The discussions in Gilead between the two pastors were way over my head, but these are more fundamental. I am not particularly interested in religion, but what I like about Robinson’s books is that they are about good people trying to be good. That is a refreshing theme these days. And the writing is superb, the subject matter approached with delicacy. I can’t recommend any book by Marilynne Robinson strongly enough. Previous Article Best Book of the Week! Years ago, I read Gilead. The writing was good, but I felt bored by it, so I haven’t read anything by her since. This one sounds interesting – I like the premise. Is it as slow as Gilead, or is there more to it? This is a good review. I like the idea that they are both worried about losing the other, but I assume they are not communicating it to each other. You know, I can see your point about Gilead especially. I think it’s the hardest to read. I got bogged down a little bit in the obscure religious discussions between the two pastors. I had no idea what they were talking about. Lila has nothing like that going on. I’m guessing that if you had trouble with reading Robinson in the past, of the Gilead novels this is the one you are most likely to like, or Home, which is about what happened with the other pastor’s son, another waif, although it is more his own fault. If you want to try Robinson again and you want something completely different, try reading Housekeeping, a much darker novel. What I like about these three Gilead novels is the innocence of the two old men and the good intentions of all the characters. But Housekeeping is related to Lila in that it also shows an interest in what makes people just take to the roads, which is the life Lila has been living (and also the son in Home, to some extent). And it doesn’t have any of the religious discussions. These preoccupations of Robinson’s with homeless people and religion make me really wonder about her background. Thanks for the advice! It does sound like I might like any one of her other books better than Gilead, It’s worth another try, anyway. Also, she is just an excellent, excellent writer. Try Housekeeping, I think, and then if you like that, try either Lila or Home. I found Home a little confusing because I read it before Gilead, and some of the background for Home is in Gilead. But you read Gilead, so maybe you’ll remember enough about the son who comes home in Home. I am so excited about this book – I have it sitting beside my bed just waiting for the right time. I want to be in a good headspace so I can concentrate properly on the writing. Loved Gilead and Home…! I think you will love it, then. It’s a bit more accessible than the other two. I cannot wait to read this. Housekeeping was breathtaking.